View of bridge, taken from the east. View of Mousemill Old Roman bridge. View of Old Mousemill Roman Bridge from North-East. View of Old Mousemill Roman Bridge from North. The original Mousemill Brig was of wood and was first mentioned in 1587. 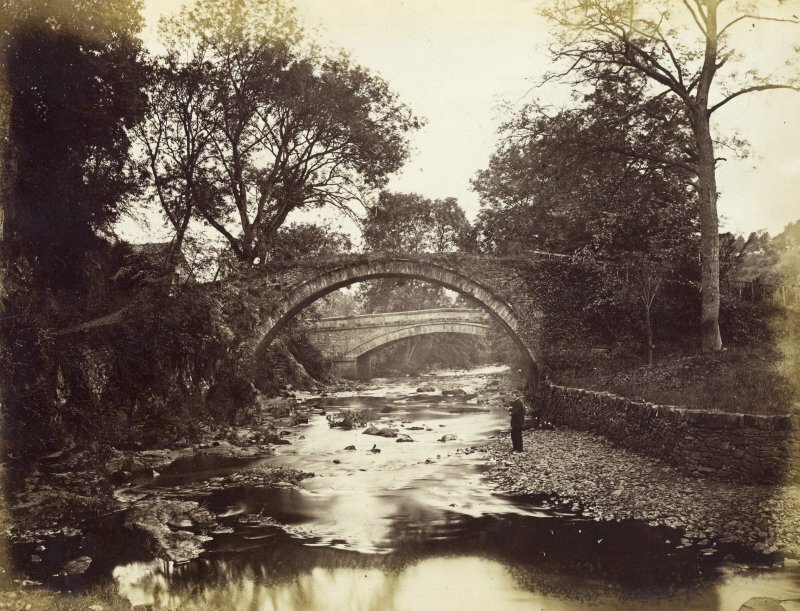 The stone bridge standing today seems to have been substituted about 1649. 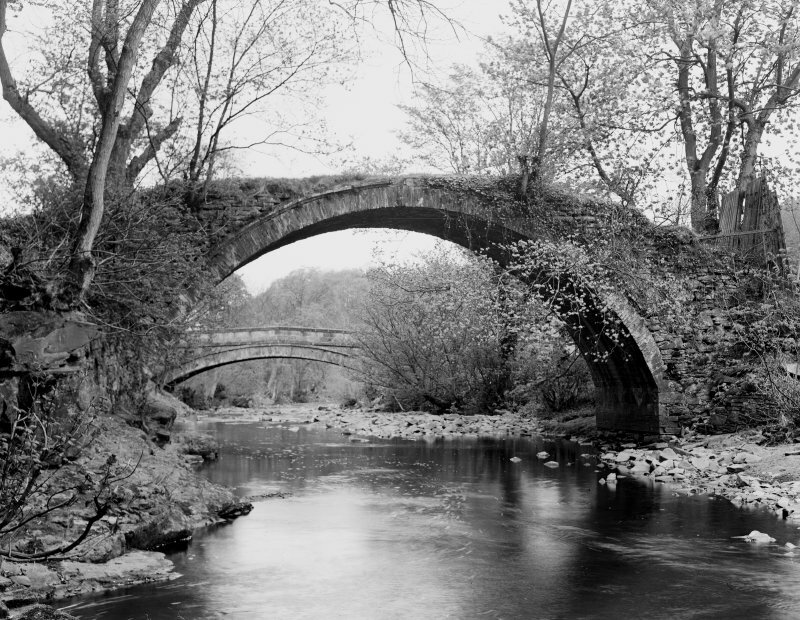 Early in the 19th century the modern bridge was built a few yards away and the old one allowed to fall into decay. NS 8694 4420. 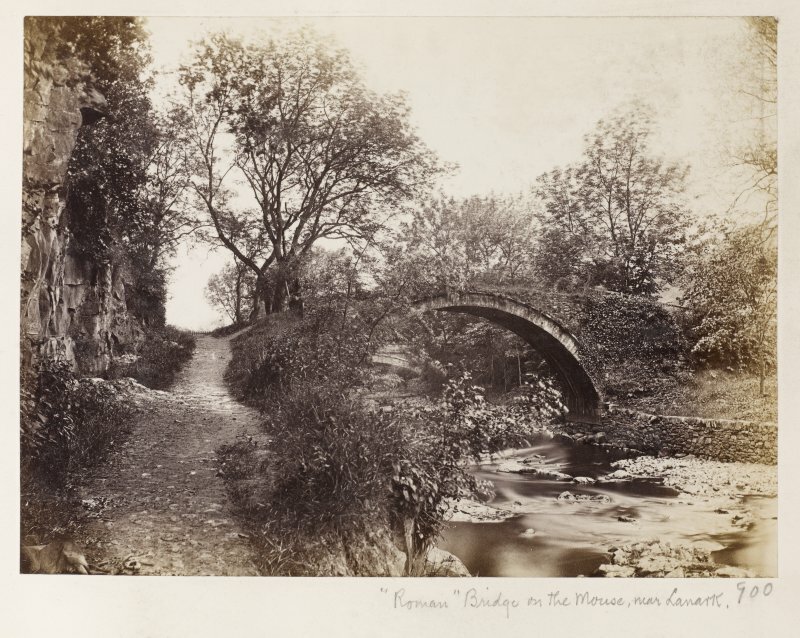 A narrow bridge with one high semi-circular arch of squared masonry. The carriage-way is 3 metres wide. The name has been applied to the western of the two bridges in error. Visited by OS (JFC) 15 March 1954. 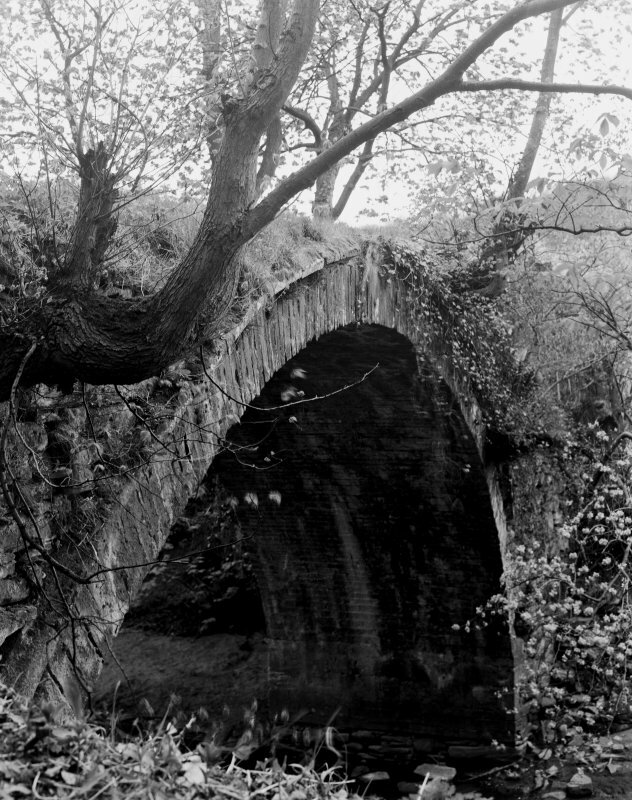 A pack-horse bridge, now disused and overgrown. The parapets have been destroyed. Visited by OS (JLD) 15 February 1962. (Location cited as NS 869 443). 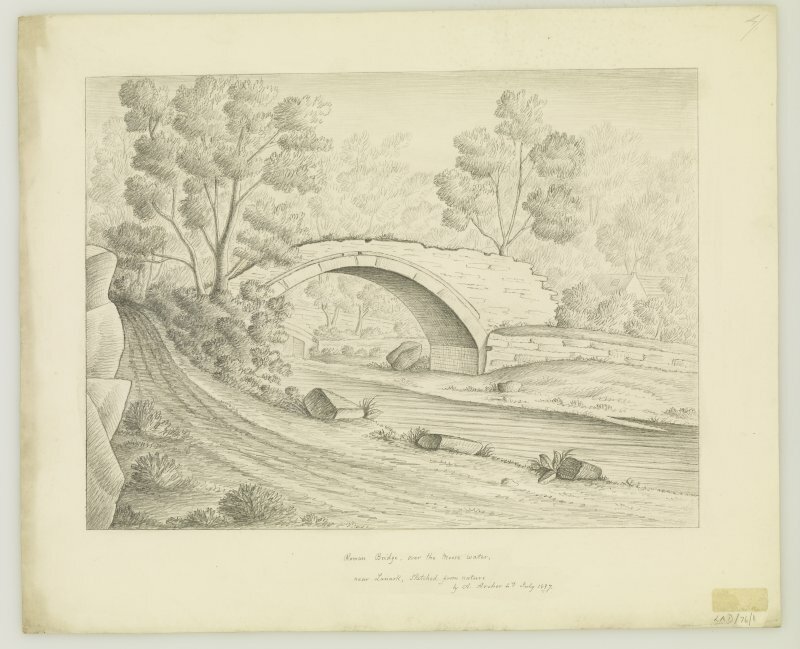 Mousemill Bridges, possibly 17th century and probably early 19th century. 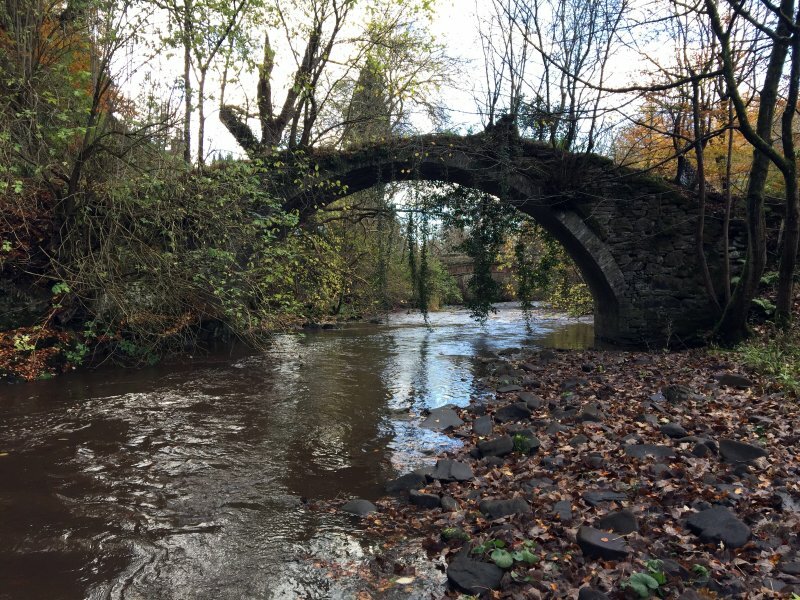 Two small segmental arched bridges, with dressed-stone arch rings. The older (NS84SE 3) has been reduced to little more than the ring. [This account also refers to the New Bridge, NS84SE 239]. This bridge carries the former line of Mousemill Road over the Mouse Water to the W of Lanark (NS84SE 75). Information from RCAHMS (RJCM), 24 February 2006. Photographic survey by the Scottish National Buildings Record/Ministry of Works in February 1965.